The Hupmobile is now at my garage resting comfortably. It even moved under its own power into the garage. Huppy day! The weather is finally getting nice in SWPA and I will get getting the 1929 Hupmobile out of my dads building this weekend. I am so excited!!! I have been working on the hubcaps, I had found 3 hubcaps and my stepdaughter and her husband bought me one on eBay. I have powder coated them and hand painted the trim in them, they are looking pretty nice. Not the original colors in them but it matches the radiator badge. Then dad was moving things around the other day and found 4 more hubcaps, some are pretty rough but I only need two more and with a little body work they came out pretty good. I am leaving two in the original chrome and will put those on the spare wheels in the wheel wells. I was looking for parts for my 1929 Hupmobile and he responded with the same email and just to mess with him, I responded and he sent me pictures of this car. . Funny as I have followed this restoration thread, from the beginning and I didn't know that Dean H. was parting out the car now!!! Here is the email that he sent me: "Great! I am currently tearing out my 1929 Hupmobile project with a set of original hubcaps and tail light in excellent shape and condition, ready to mount on. I'm asking $300 and happy to arrange delivery via USPS or Fedex ground to your door step and would acknowledge a Walmart to Walmart payment. What's your complete shipping address? Many thanks again and regards, John"
I think the AACA Club should open it's own "AACA Museum"!!!!! I would like to know what the framework is that the aaca Museum speaks of? It was OUR Museum, bought and paid for with AACA CLUB members money, they stole it from us! Don't use OUR name if it is not ours anymore! Have you checked to see what voltage the light bulbs are? Pull a bulb out and check the numbers on it and report that information back here. Is it possible that someone converted the starter and generator to 12 volts and left the original tags on them? Not very good pictures but it might give you an idea of how it is hooked up. If you need better pictures let me know. This is an 8 cylinder. Keiser, I emailed him. That one is a Nash light as I can see "Nash" in the red area, but he does say he has some without the Nash word. They are wire wheels, yes, big difference. Thanks Keiser! I am looking for hubcaps for my 1929 Hupmobile Century M sedan. It is a 8 cylinder so the hubcaps will have an H & 8 intertwined on the cap. The tail light is manufactured by Staub and would look like the one pictured on the lower left hand corner. If you have any tail light variants for a 1929 let me know. Let me know what you have and a price. With the 74 degree temperatures today, I got some painting done on the hood and fender of my 1990 Thunderbird. I got the base and clear on the underside of the hood and backside of the fender. Now to flip them over and paint the front side the next warm day we get. Installed three of the four threshold on the Hupmobile last night. They look pretty good for being originals. The threshold on the passenger side front will have to wait as there is a spacer that is in the way on the underside of the floor. I will have to loosen the body mount bolt and lift the body slightly to slip the threshold in, then lower the body back down. It shouldn't be too hard, but I didn't feel like doing it last night. Also straightened a bumper bracket(those chrome dividers, it wasn't straight up and down) on the rear bumper, it had been bugging me and I loosened the bolt and got into a bigger job than I wanted. I finally got it back together and it looks much better. Been doing some work on the Hupmobile while it is in a nice warm building. I have decided to replace the carpet that was put in the car years ago as a temporary carpet. It was an old oriental rug that was probably worth thousands of dollars. The new carpet is not of original style but it does look much better than the red carpet that was in there, and I have had this carpeting laying around for years. I bought it at Hershey many years ago and used a little piece in the Crosley pickup truck a few years ago, I think I paid $20 for the roll and still have enough left to do several more cars. I have cleaned up the thresholds and the next time I go to the building I will try installing them. 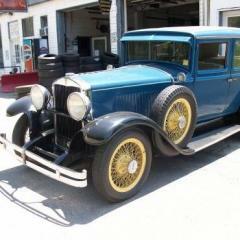 I have bought my dad's 1929 Hupmobile that he bought way back in 1968. I was just a little tike when he brought it home. It was all apart and needed restored, which was done over the next few years. I can remember handing him tools and watching as he worked on it. We went to many car shows and drove it a lot for several years, then other cars came along and the Hupp got relegated to storage, dad saying the car wasn't safe to be on the road with the newer cars. It was driven a few times in the late 90's and then put away again. 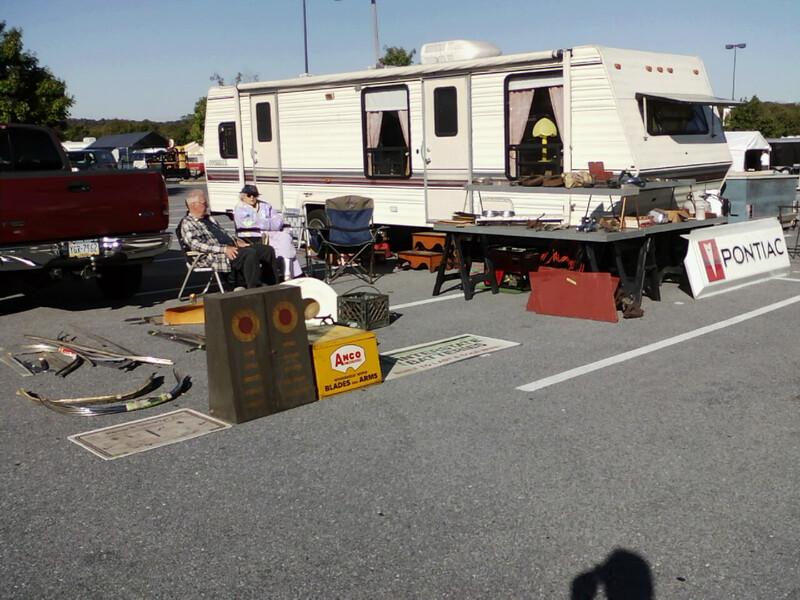 He decided last year to sell all his cars and I told him that I wanted the Hupp as it had so many memories. So I now own it and I would like to do a few things to it to make it look a little better. Mechanical work(cleaning fuel tank, changing oil, etc) will have to wait till I can get it out of his building in the spring. Some of the things I would like to do is get some new carpet in it, not factory, but something that looks nice. In looking at it I have found that the door thresholds were never installed and I would like to know how they fit. If someone has some detailed pictures I would appreciate it. I also would like to get the correct taillight for the car. I think I have enough hubcaps, but a few spares would be nice... One other thing for right now would be the switches on the steering wheel are incorrect and would be nice to have the right ones. I want to keep it like I remember the car, but I also want to make it mine. Here are a few pictures of the car for those that are interested. I haven't posted a report on the FOR in quite some time so I thought I would give a quick update. Still no work done on the FOR as this year has been busy selling my dads car collection. Had 17 cars to sell and now have 6 cars left. 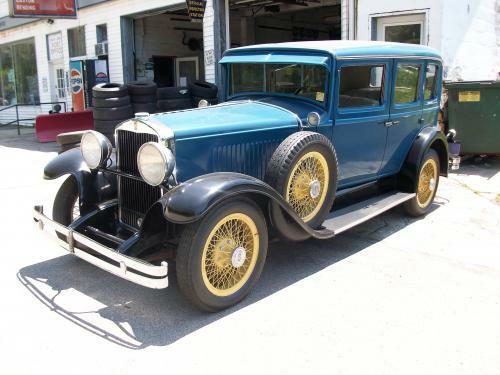 I have bought his 1929 Hupmobile and I will be doing a few things to it to get it back on the road this winter, I hope. I have been busy repairing crash damage on two of my vehicles, in June, my Thunderbird was hit in the front by a driver that cut the corner short while turning and didn't see me. Then in September, just 4 months after getting a 2014 Ram Pickup a guy rear ended me at a traffic light, he didn't see my BIG Blue Ram truck?? Both accidents were not my fault, and repairs are still ongoing on the Thunderbird, after buying a complete car for parts, and gathering NOS parts online. The Ram is repaired and looking good again. Thanks to a Crosley Member I also got the "Crosley" license plate frame replaced (free) that was damaged in the Ram accident!! Car guys are awesome. The FOR body has been taken off the cart and stored in my back room like a crate of potatoes... LOL I hope to get to it soon as I want to take it to the nation Crosley meet in July. Merry Christmas and Happy New Year! Here is hoping for a better 2018!!!!!!!! !